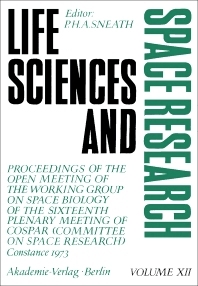 Life Sciences and Space Research, Volume XII documents the proceedings of the Life Sciences sessions of the 16th Plenary Meeting of the Committee on Space Research (COSPAR) held in Konstanz in May and June 1973. This compilation includes several studies on the biological effects of radiation produced by particles of very high energy, including the kind of cellular damage these particles cause and the technique for recording particle tracks in relation to biological objects. The effects of weightlessness upon developmental processes in biology and the interaction between weightlessness and other effects of space flight are also deliberated. This book likewise provides a brief discussion on the field of planetary quarantine, implying that all the planets should be protected from unwise contamination. This publication is valuable to students and researchers conducting work on exobiology, radiation biology, gravitational biology, or planetary quarantine.